Be the first to share your favorite memory, photo or story of Moniece. This memorial page is dedicated for family, friends and future generations to celebrate the life of their loved one. Moneice VanDiver was born on November 12, 1927 in Winston Salem, North Carolina to the late John and Mary Gaddy Sherard. She attended the Winston Salem Public School system and later attended Winston Salem Teachers College. She graduated from the Russell Commercial School in Winston Salem. Moniece worked as a Secretary for two funeral homes, Braun Funeral Home in Winston Salem and W. I. Peek in Anderson, South Carolina. In 1958, she came to New Jersey. She worked in the office of the food service department at Overlook Hospital in Summit where she retired after 33 years of service. 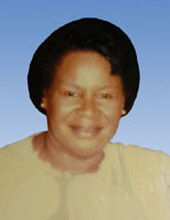 She was a member of the Heard A.M.E. Church for 50 years where she was a member of the Emergency Choir, the Steward Board and the Senior Health Club. Moniece was an avid bowler who scored a perfect 600 in a game. She was a member of the 600 Club Bowling League in Roselle from the 1980s to 1990s. On Thursday, September 6, 2018, Moneice VanDiver departed this life at the age of ninety. She was predeceased by her husband, Clarence VanDiver, Sr.; son, Marvin VanDiver; and companion, John Odums. Moniece VanDiver leaves to cherish fond memories, her four children: Clarence, Michael, Rhonda and Le Ferrell VanDiver; sister, Doris Morrison of Winston Salem, North Carolina; nine grandchildren: LeVon, Derek, Cory, Erin, Le Ferrell, Jr., Jennifer, Jessica, Danielle and Marcus; 2 great-grandchildren: Jenesis and Faith; four daughters-in-law: Iris, Alicia, Karen and Shelia; and a host of nieces and cousins. To send flowers or a remembrance gift to the family of Moniece "Rene" VanDiver, please visit our Tribute Store. "Email Address" would like to share the life celebration of Moniece "Rene" VanDiver. Click on the "link" to go to share a favorite memory or leave a condolence message for the family.